Video referees: What happened in England's first experience with new technology? England boss Gareth Southgate believes video technology "won't always get it 100% right" after France had a player sent off in their 3-2 win over the Three Lions in Paris. Raphael Varane was dismissed for bringing down Dele Alli for a penalty, which Harry Kane scored. Southgate said: "I assume the referee wanted to make sure and if he can, then it's a sensible decision. "There will still be an element of one person's judgement in that." France played for almost the entire second half with 10 men but still won the friendly at the Stade de France, which was the first England international to feature video assistant referee (VAR) technology. "Even with the video, you won't always get it 100% right," said Southgate. "I've not seen it again but from my initial view I thought it was the right call. From where we were it looked like a clear penalty and then a sending off. "If people are saying otherwise then I would have to see it again." 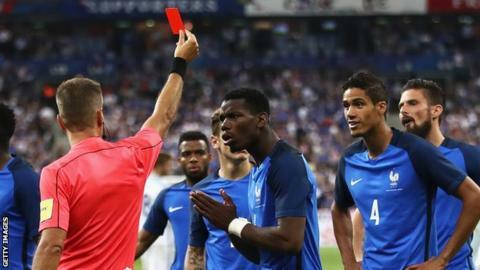 France coach Didier Deschamps added that the sending off "was quite harsh". The second half was just over 30 seconds old when Alli broke into the penalty area and went down after contact from Real Madrid defender Varane. Referee Davide Massa immediately pointed to the spot and took the yellow card from his pocket, without showing it to anybody. He was then in contact with the video assistant referee (VAR), holding his earpiece to his ear while being confronted by several France players and England's Kyle Walker. Unlike in other sports which use video technology - cricket or rugby, for example - broadcasters and supporters cannot hear what is being discussed by the officials. After exactly a minute, Massa showed the red card to Varane. Why was Varane sent off? After reviewing the incident, the video assistant referee decided Varane's challenge on Alli was deliberate and therefore worthy of a red card - not the yellow that referee Massa was poised to show. New rules introduced at the start of last season mean giving away a penalty 'as the last defender' does not now necessarily mean an automatic red card. Players committing accidental fouls that deny a goalscoring chance should now be cautioned instead, while deliberate fouls - including holding, pulling or pushing, not playing the ball, serious foul play, violent conduct or deliberate handball in order to deny a goalscoring opportunity - will still incur a red card. Although Varane appeared to try and pull out of a challenge on Alli, there was contact and he could have been adjudged to have not played the ball. As Southgate suggests, despite the assistance of technology and the opportunity to review the action, decisions such as this will still effectively come down to one person's interpretation of an incident. BBC senior football reporter Ian Dennis said: "The video referee is still open to interpretation and therefore human error. Seven out of 10 decisions will be correct but with the three that will be incorrect all hell will break loose." What are Video Assistant Referees? Video assistant referee (VAR) technology can only review incidents relating to goals, red cards, mistaken identities and penalties. Video assistance was introduced for the first time in a Fifa competition at the Club World Cup in Japan last December and is being used in select competitions. It was used to correct two decisions as Spain beat France in a friendly earlier this year, having previously been used in France's 3-1 friendly win in Italy last September. Fifa president Gianni Infantino has suggested the system will be used at next summer's World Cup finals in Russia and the Football Association wants to test the system from next season's FA Cup third round. It could also begin in the EFL Cup first round in August.